English Bramley apples have to be the first choice for a traditional apple pie. They are nutritious, easy to prepare, full of flavour and keep their shape beautifully when cooked. Their flavour is enhanced by adding lemon and a little spice, as well as brown sugar. Preheat oven to 190°C, gas mark 5. Roll out two-thirds of the pastry on a floured work surface using short, sharp strokes - give the pastry a quarter turn between each rolling. Line a 20cm deep pie dish with the rolled pastry, leaving any excess overhanging. Chill the pastry in the fridge for 30 minutes. Thickly slice the apples into a bowl of cold water to which the lemon juice has been added - this will stop the apples turning brown. Mix together the lemon zest, sugar, flour and spice, and sprinkle a little onto the pastry in the dish. Drain the apples thoroughly and pat dry with kitchen paper. Cover the pastry base with half the apples, sprinkle with half the sultanas, and half the remaining sugar mixture. Repeat with the remaining ingredients and dot with butter. Brush the pastry edge with a little milk or water. Roll out the remaining pastry and use to cover the pie. Seal the edges well and trim any excess with a sharp knife. Cut two slits in the top of the pie to allow the steam to escape, brush with milk and sprinkle with caster sugar. Place on a baking sheet and bake for 30-40 minutes, until golden brown. Cool for 10-15 minutes before serving. Serve hot or cold with Waitrose Fresh Custard. Use any pastry trimmings left to make decorative leaves for the top of the pie. 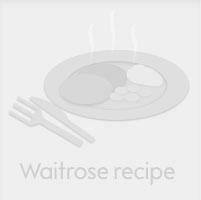 This recipe was first published in Mon Oct 01 01:00:00 BST 2001.